Are you planning a summer road trip? Here are some ways you can make a family road trip more enjoyable, and less crazy. 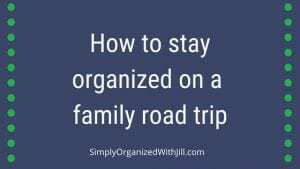 Thoroughly declutter your vehicle before packing for the trip. Remove unnecessary items, i.e. trash, mail, work stuff, sports gear and stray clothing. Have your car serviced a few weeks before your trip. Better yet, consider renting a vehicle. After experiencing major personal vehicle breakdowns during two of our road trips, we decided rental cars were the way to go! The peace of mind it brought us was priceless. Help your kids pack a backpack with their own entertainment supplies for the trip. Label all electronics, chargers, and headphones to avoid mayhem. Bring along a large empty duffel bag to fill with dirty clothing. Keep the bag in your car because it will become heavy. Then place your dirty clothing inside it each day when checking out of your hotel. Pack bulky outerwear into one bag. This will make it easier to find when it’s all in one place. I’m guilty of taking more than I need while traveling while my husband brags about how little he takes. I’ve told him it’s not a contest. In order to fit excessive amounts of clothing into my suitcase, I tightly roll it. I have to have a good selection of clothing, for every kind of weather event. Before leaving the hotel, carefully check every nook and cranny for belongings but resist grabbing the tiny bottles of shampoo, unless you’re positive you’ll use them. Straighten the car at the end of the day. Have the kids gather their things and return them to their backpacks. Remove all the trash. You’ll appreciate the tidiness when you buckle up the next day. Tell me about your favorite road trip in the comments below.